The Berkman Center kicked off this year’s Luncheon Series on Tuesday, September 11 with a stimulating presentation from world renowned physicist and professor at Harvard’s Department of the History of Science, Peter Galison. 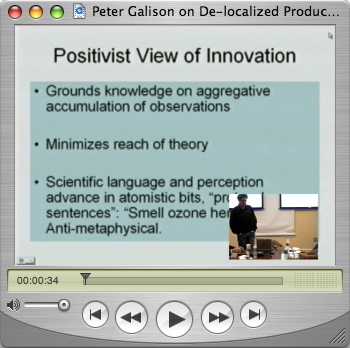 Peter is the Joseph Pellegrino University Professor at Harvard University, a MacArthur Fellow, and spoke on his work around the de-localized production of scientific knowledge–on the ways in which “trading zones” form at the boundary between different scientific languages and practices. Peter summarized the kind of work he has done on contemporary, massive, spatially dispersed collaborations in physics experiments, and more recent work on the early telegraph networks that so shaped the early formulation of relativity theory.